So I'm Bracing for Ninninger! So we have the ninja time done three times. During the 90s and last decade, we have had Kakuranger and Hurricanger. Hurricanger can also be considered a Liveman inspired Super Sentai aside from its obvious ninja theme. I won't comment too much on the cast yet but I can give my comments on a few stuff. I got all these stuff from Orends Range. 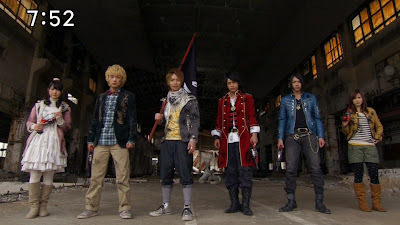 The costumes sort of look like Shurikenger inspired. Granted, the title is SHURIKEN Sentai Ninninger. So far a huge improvement from the rather bland costumes of ToQGer. For ToQGer, I'm going to try to see how the finale will be. Okay, I don't hate Naomi Takebe but I wasn't impressed with how Gobusters went. But she was also responsible for Kamen Rider Kiva and Kamen Rider OOO, two silly seasons of Kamen Rider that I enjoyed. She was also responsible for Kamen Rider Gaim. She also mentioned that these ninjas are not in the norm of fun and anything that is fun (taken from here). My Current List Of The Most Cruel Villains In Super Sentai! So based on a list of villains from Sentai series I've seen from start to end AND my current viewing (Gingaman with 38 episodes, Ohranger with 20 episodes, Kakuranger with 40 episodes), here are villains I considered to be really cruel. None of these villains ever had any moments of being funny. These villains are those who make it into the top list of being cruel. If you don't mind being spoiled then go ahead and read. If not, don't read any further. ToQGer is having a V-Cinema which were however not the non-canon VS Movies. Instead, we have a special that takes place after the series ends. The series that had a V-Cinema prior to ToQGer where Timeranger, Shinkenger, Goseiger, Gobusters (which they met an alternate version of Gobusters), Hurricanger (10 years after) and Kyoryuger (where it happens 100 years later). What is amazing is that Timeranger, Shinkenger and ToQGer are Super Sentai which were under Yasuko Kobayashi. Too bad Gingaman didn't have a V-Cinema (coincidentally Saban also promised a movie for the cast of Lost Galaxy but screwed it up). The V-Cinema started with Timeranger where this non-canon episode had them view the Super Sentai before Timeranger. Shinkenger's V-Cinema was a massive clip show... involving different scenarios. The Shinkengers must overcome the illusions they are trapped in. I thought it was a pretty silly V-Cinema which I usually don't rewatch in contrast to the series. I'd like to present my rambling on MMPR Season One vs. Zyuranger as the Super Sentai DVD will soon be released. So I still have a soft spot for the first season and I'd like to talk about Zyuranger as well. So I'd like to do some rambling. So it's not a hate ramble, in fact I will present both sides of the coin and how both sides differ a lot. I'll share my opinions on both shows one way or another. Just a bit as the title suggests, I'm NOT going to go beyond MMPR Season One. Instead, I'll compare the first season with Zyuranger. Sentai Rambling: Why I Believe Shinkenger Totally Overshadows Power Rangers Samurai! After with some time rambling on everything wrong in Power Rangers Megaforce as an anniversary season, I can now ramble on what went wrong with Power Rangers Samurai. Again, this is NOT a call to become a Sentai purist but me playing my concern on the welfare of Power Rangers since it's part of Toei like Saban Entertainment, Disney and as of recent Mr. Krabs. So let's begin. I had high hopes for Haim Saban's return but Power Rangers Samurai had convinced me he has become Mr. Krabs. 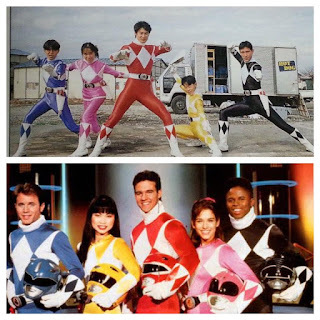 It's a bad comeback for Saban and this series may have hurt Power Rangers fans too. Ressha Sentai ToQGer and Similarities With Some Kamen Rider Seasons! While watching Ressha Sentai ToQGer I just noticed that the series itself tends to push me to remember older Super Sentai. While I would have been okay with a more Flashman-type plot inserted into it (Flashman is the only series to have children kidnapped and raised in space, I'd love to see it again). However ToQGer is more prone to make you think of previous Kamen Riders? For some reason, I always looked at Right as Wataru 2.0 without a lover. If I can compare Gingaman to Jetman and Timeranger to Agito, ToQGer feels mostly like Kiva mixed with Den-O and Wizard elements. It's throwing back to Kamen Rider in some way. 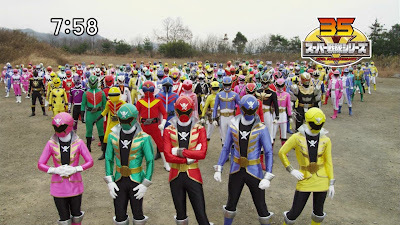 Sentai Rambling: How Kaizoku Sentai Gokaiger Succeeded as An Anniversary Season in Contrast to Power Rangers Megaforce! So I rambled about how Power Rangers Megaforce's eye candy is inferior to Shinkenger, while I can conveniently skip Goseiger but I'll discuss on Gokaiger. Now I'm not really the biggest Gokaiger fan there is... and I like Timeranger, Gaoranger and Boukenger over this season. Okay it's written by Naruhisa Arakawa. Again, I am not writing this as a Sentai purist but as a person who is concerned for the well-being of Power Rangers. I don't like Power Rangers as of current (again) but I don't hate it. I still care about its fans and Megaforce was one show that's WAY TO SCREW UP your potential anniversary season and I wonder if fans were really butthurt by what happened. And now, this is my second rambling. My First Impression of Ohranger in Twenty Episodes! So I haven't really seen much of Ohranger before, only bits and pieces of raw videos. But with the available videos from Millionfold Curiosity (the same fan site that did Megaranger and Gingaman)... here's my impression of Ohranger (subbed) in twenty episodes! I due fairness, I hate to admit that I feel like a "Super Sentai purist" again after seeing this. But as said, I must cast aside my feelings for Power Rangers Zeo and focus on Ohranger as itself. Zeo did't ruin Ohranger, it ruined itself. I'll give my impressions on the members. 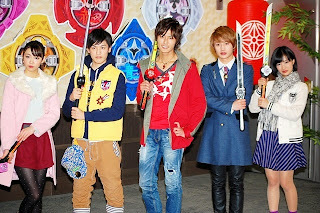 Sentai Rambling: Samurai Sentai Shinkenger's A Decent Eye Candy Filled Show Over Power Rangers Megaforce! I felt the urge to write this article on Shinkenger being a decent season with four times the eye candy. So I did pass through Power Ranger Samurai (which was boring and a bad comeback for Saban) then we have Power Rangers Megaforce. So I'd probably skip comparing Shinkenger to Power Rangers Samurai or Gokaiger to Power Rangers Megaforce because the topic here is eye-candy related but I may write the topic another day but again, I find it "self-explanatory" and Gokaiger vs. Megaforce for me is also pretty "self-explanatory". 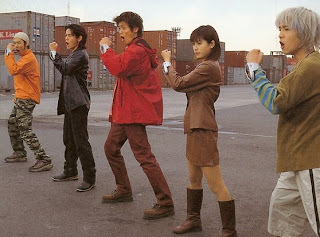 Super Sentai Rangers Who Transformed Using Their Rage! Gai Yuki/Black Condor- Before he defeated Vacuum Jigen single-handedly, all the rage in his body allowed the Birdonic Energy to transform him into Black Condor. Ryu Tendo/Red Hawk- During the time he went to try and get revenge for Rie's death, he faced Radiguet. He was engulfed in Birdonic Waves and NEVER touched his Cross Changer to transformed into Red Hawk! Lin/Hououranger- After seeing her lover Takamura die, her rage transformed her into Hououranger which she beats Lt. Gara so badly. Sentai Badass Villain Edition: Doctor Man Fools the Big Three! There's no doubt Doctor Man is one awesome badass. He did blow his cover way back in episode 19 when he said Prince was his son. Neither Mason nor his comrades were aware of Doctor Man being human until episode 19. Doctor Man had prepared a scheme that effectively proved he doesn't easily fall down. In this episode, the Big Three finally decided tio get rid of Doctor Man. That's it, we're through having a human for a leader. Gear was a mechanical empire and they thought that Mecha Humans should not be led by a human being. The problem already started when Prince was introduced. Mason never expected Doctor Man to be a human. The fact Doctor Man said, "A robot can be replaced." made everyone startle. They couldn't believe their leader was a HUMAN! So they conspired to kill him, it looked like he died but not if you know how terrifyingly cunning Doctor Man is! Kaizoku Sentai Gokaiger: A Season Long Super Sentai Crossover! Kaizoku Sentai Gokaiger is more or less a season long crossover. In what way? Gokaiger as the 35th Anniversary of Super Sentai features a what if scenario. This what if scenario is what if all the 34 Super Sentai existed in the 35th season. While the Sentai timeline is non-existent for majority of Sentai's seasons, if not at all, one can see Gokaiger as a what if scenario. Event he first episode is a major crossover. 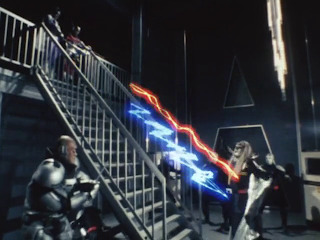 Prior to the start of the plot, the 34 Super Sentai led by the Gorangers battle the Zangyack Empire's massive invasion. In the process, they sacrifice their powers to defeat the Armada. In return, all the powers become Ranger Keys which while directly accessible to its original user, only a Mobirate User may use them. 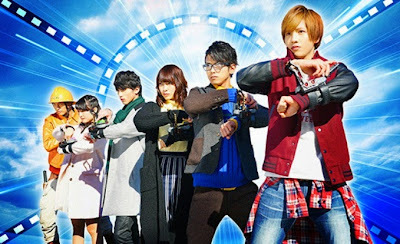 Like Kamen Rider Decade but way better, the Gokaigers can access the power of the 34 other Super Sentai. 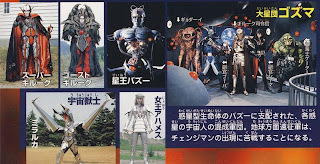 The Great Star League Gozma from Dengeki Sentai Changeman were destroying planets. Its ruler Bazoo had a habit of conquering planets while keeping some people at his command. He has Giluke as his captain from the Planet Girath, Ahames was from the planet Amazo, Shiima was from Planet Amanga, Gator was from Planet Navi and Booba was a space pirate. Bazoo would threaten his followers with destruction of their home planets if he failed them. Toei said it themselves, that every sentai season are their own continuity, and that the team ups are considered non-canon. However, after reading this post, now I'm starting to question, "Does Toei actually know this themselves?" Ugh. My head hurts. I didn't know this was such a big matter of debate among fans. So I want to think about how Super Sentai itself has actually operated efficiently with a self-contained continuity and the team-ups (more like what if team up) were non canon. So let me discuss my thoughts. 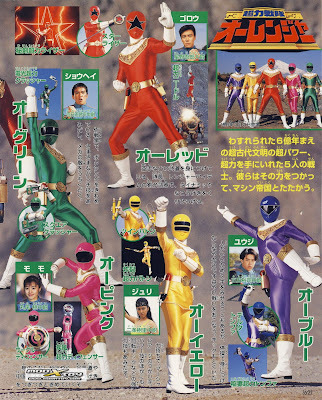 Most of Super Sentai usually existed self-contained and crossovers weren't very much existent. Maybe Goranger and JAKQ belonged to the same continuity but the rest, nah. Mirai Sentai Timeranger: A Complex Battle With Fate! Happy New Year! This is my first post for the new year! After seeing Timeranger (but mostly in bad quality videos) I thought I would write about the complex battle with fate of Timeranger. Okay I'm enjoying Gingaman thus far, here's me crossing for more Timeranger quality video subs (since I had seen most of it raw but fortunately synopsis were available). I just thought another masterpiece of Yasuko Kobayashi before her eventual burnout was Timeranger! Warning there will be spoilers ahead as usual, so read at your own risk!